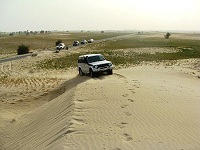 The idea of drive through Thal desert was floated by few friends at the time of Cholistan desert Rally. The intention was to see how feasible Thal would be in case a Rally is organized here. We had some readily info available from Salman Niazi and Jeepaholic but it still needed a thorough recce. The teams were split in three in the beginning as Ali Zafar (Charged) and myself had to go through Lakki Marwat owing to some family commitment. Rao and Fihsak had to join us directly on the morning of March 24th. Whereas Adnan, Ali Aden, Shahid bhai and Yousaf Niazi had to reach Thal desert’s outer rim on the 23rd. The RV for all teams was thus kept at Noorpur Thal on 24th March. By the time all the three teams reached the RV they had already done some bit of offroad and sand driving, hence we were all charged to take Thal, this also included a specially arranged (by Shahid Bhai) river crossing of jeeps through local boats – scarey but very interesting. Left Noorpur around 11ish to see Mankera Fort. Reached around 12:45 and were disappointed to see nothing but just a left over of the walls which at first signed wasn’t convincing to be a fort however later after visiting Nawab sahibs Mazar and studying the area in detail we were convinced. Moved back to the main road and we had to rush to Khatwan where we would need to camp for the night. We chose to follow the GPS through the desert and not any mateled road. This part was full of fun and had the adrenalin pumping through high speed sand runs. It was a short 20-30 mins run till I weared onto a dune and go stuck in deep sand. Adnan tried to pull me out and he also got stuck (Adnan now don’t give explanations on how that happened) Then came Rao in his Jero and barely escaped the wreath of the desert. He tried again and was able to pull out both Vigo and my Pajero out. Kept playing in sand till night fall and then reached at camp site quite late. Few of us had to leave back owing to commitment in the morning hence after having a good cup of tea and some snacks we all packed and left for our destinations. Our reading for the area is that it has loads of potential for hosting a good rally however that would only be possible from Nov-Jan end. Feb onwards the inhabitants cultivate channa and the entire desert turns green. That is just not the right time. Alhamdollilah the event – though very short but went well. Thanks to the all the members of IJC and friends for making it yet another success story. Follow the topic for the rest of the pics; IJC goes on Thal expedition.